During my April trip to Georgia, the group I was with went to visit the Callaway Gardens Chapel In The Woods, a very peaceful location. A few purple irises were growing at the edge of the water just in front of the chapel. I spent a good deal of time working on the camera position to try to get a background that didn't detract from the beautiful simplicity of the flower. Working to get a good composition and a clean background can really make or break a photograph. I like the results I got in this composition. I positioned the camera relatively high so that the water behind and in the distance from the flower would serve as a clean background. The focal length of the lens was 300mm (using my 100-400 zoom) which was able to blur any details in the water because of the limited depth of field at 300mm, even at f8. The sky was blue and thus the water itself had a bluish tonality, complementing the flower. It's March. I don't think it's too early. I don't. I have been waiting since November! I've already forgotten about that 'Tree In Snow' picture I put up for my last post. 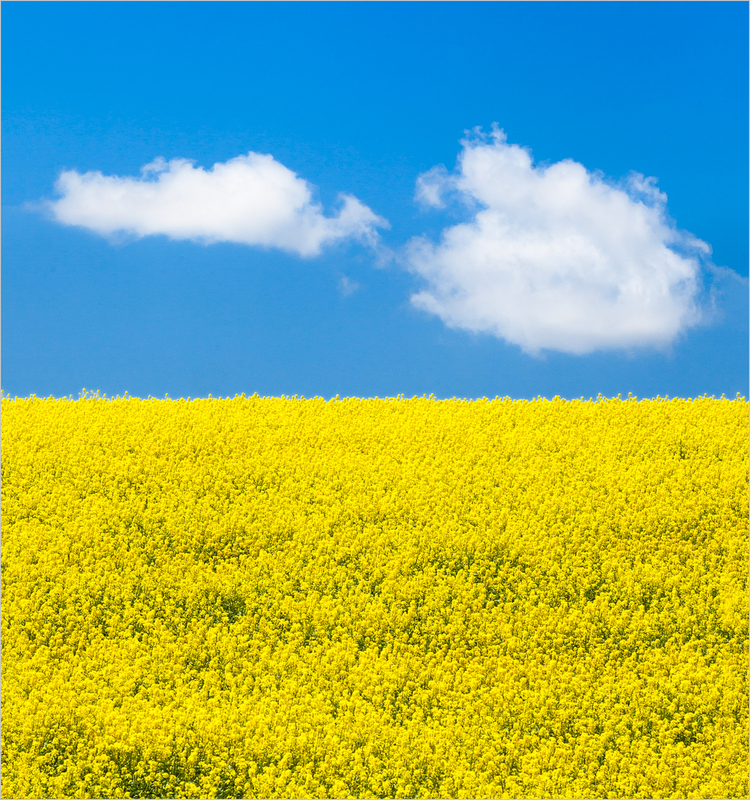 This image was taken with a Lensbaby during spring a few years back and then combined with a texture. Photography is all about light, and I think one of the most dramatic types of light is backlighting, particularly when the light is coming through or around a transparent or translucent object. At the end of March I was walking indoors through the small botanical garden near my home (Spring still seemed a long way off, though it should have already arrived) when I saw sunlight streaming through one of the glass walls of the greenhouse. That is usually a good sign to check and see if there are any flowers that are appropriately shaped to take advantage of backlighting. There were some freshly blooming tulips, and one in particular was right in the 'beam' of light that was streaming in behind it. The yellow tulip seemed to be on fire and lit from within. The tulip was growing in a window-box of sorts and so it wasn't too difficult to make the photo at 'eye'level'. I decided to put the focus on the area where the stem turns into flower and let the rest of the bloom simply explode into a blur of yellow flames. The artist's statement can be very difficult to write. It is often filled with artspeak that is incomprehensible to the average everyday viewer. I found myself wanting to write a very plain and simple statement to go with my black and white botanical project which I am calling "Floral Forms". I wanted it to clearly state what the project was about without a lot of verbiage that would make the average "non-artist" viewer roll their eyes. The following is what I came up with. Have I succeeded? One of the most prominent characteristics of flowers are their brilliant and varied colors. So why would anyone want to portray them in black and white? We don’t live in a monochrome world. Colors are our reality and one of the first things we tend to notice. In fact, the more vivid the color the more it attracts our attention and becomes an object’s dominant characteristic. Removing that color from a flower, or any other object, allows us to concentrate on other attributes. We can start to appreciate a flower’s form, shape, curves, and lines. We can pay more attention to the various characteristics that previously had to take a “back seat” to color. It is my intent that these images allow the viewer to see a flower’s beauty in a new way; a way that might have been easily overlooked. Black and white allows us to see differently. It affords a way of seeing that focuses on “Floral Forms”. This post, in many ways, seems like a good follow up to my prior post on Receptivity. I am intrigued how sometimes one can visit the same location and really 'see' and at other times find nothing to photograph at the exact same spot. Just last weekend I went to the local conservatory for my Sunday morning photo session with my friends . From the start I felt the creative muse joining me. It seemed the exact opposite of those days when you go to photograph and just feel ahead of time that you aren't going to have vision and you know there won't be any keepers. It happens. This time, however, I started seeing images everywhere I looked. I started seeing compositions in multiple locations. I found the image I made below the most interesting of the bunch for one simple reason. I had passed by these same flowers several weeks in a row and could not find a way to photograph them. No interesting compositions. Nothing. It was difficult to photograph them because they are actually quite flat and relatively two-dimensional. But, today was different. I found many ways to photograph them and took several photographs that I like quite a bit. But the one below is my favorite. I saw a rocket ship with fins. I saw laundry blowing in the wind. I saw pink banners. The point is that I saw...... I guess that happens when the muse walks with you. Another selection from my black and white botanical project. I had taken this photo some time ago but never felt the right inspiration for processing it. I was recently looking at some work by a photographer/artist I admire who is very expressive and really pours her soul into her artwork. She is less concerned about the technical perfections of an image and is more about the feel and mood she creates. Her work inspired me to process this photo in the way I had intended when I took it......to give the feel of just starting to emerge from a dreamlike state. 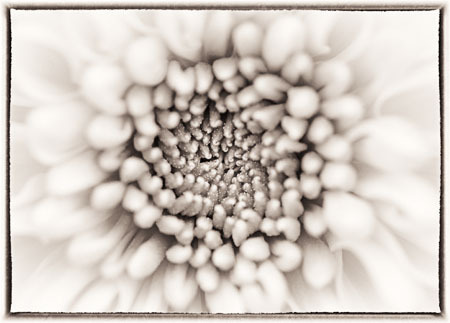 By Howard Grill The newest print from my black and white botanical series. I have slowly been going through my older botanical color prints and seeing what might look good in a toned black and white version. Many don't. I thought this one did.